Jeff Hamilton and his Dad in 1967. Jeffrey S. Hamilton, the founder and CEO of Hamilton Tree & Landscape, was born on April 10th, 1955. This was a busy Easter Sunday in the maternity ward at Tobey Hospital, which is now the Falmouth Hospital. As a result, doctors were forced to utilize a broom closet in order to bring Jeff into the world. Jeff was born to Jesse and Madeline Hamilton and was the 4th of 5 children. To assist in raising the family, Jeff’s dad, a carpenter at the time, acquired a few landscaping maintenance contracts primarily for summer estates. Jeff and his older brother would help their father on the weekends at some of these properties to make their contribution to the family finances. In 1976, three years after graduating as a member of the last class of the Lawrence High School, Jeff began working at the Woods Hole Golf Course where he was soon encouraged to pursue a career in golf course management. In 1978, Jeff graduated from the Stockbridge School of Agriculture in Amherst, Massachusetts with a Turf Management Degree. To supplement his income, Jeff continued to service many of the same properties that his father had accounts with. Soon he became too busy with his increasing landscape accounts to continue working at the golf course, so he decided to fully commit himself to his expanding landscape company. It was certainly tough in the beginning. In order to build credit, as well as survive the Cape Cod winters, Jeff would take out a bank loan only to repay it by mid spring. He also sought out snow shoveling accounts and even some small tree work accounts just to make it through the winter. In August of 1982, Jeff married Alexia Sullivan and settled down in West Falmouth where they built a home on 1.6 acres and began their family. As Jeff’s business grew to 6 employees and his family grew to 5, it became obvious that the neighborhood would not sustain the growing landscape and emerging tree interests of the company. During Jeff’s childhood, he remembers delivering the newspaper to a prominent landscaper at the time. His name was Abner P. Briggs of Quissett. Briggs can perhaps be credited with the largest boost for Jeff’s company. As Mr. Briggs aged, he and his workers eventually could no longer trim hedges taller than 5 feet. That’s when he began subcontracting Jeff’s company to assist him. Their relationship became so great that Brigg’s landscape shop was ultimately obtained by Jeff in 1997. As Jeff and Alexia’s family and business matured, so did their sense of community. Over the years, they have sponsored youth baseball teams and have been involved with many different aspects of the Falmouth Road Race, whether it be through housing athletes, setting up finish line tables, or even donating bucket trucks to assist with photographs or banner displays. Most recently, Jeff’s involvement with the 300 Committee to help develop the Teaticket Park for all ages to enjoy is one of his proudest endeavors. 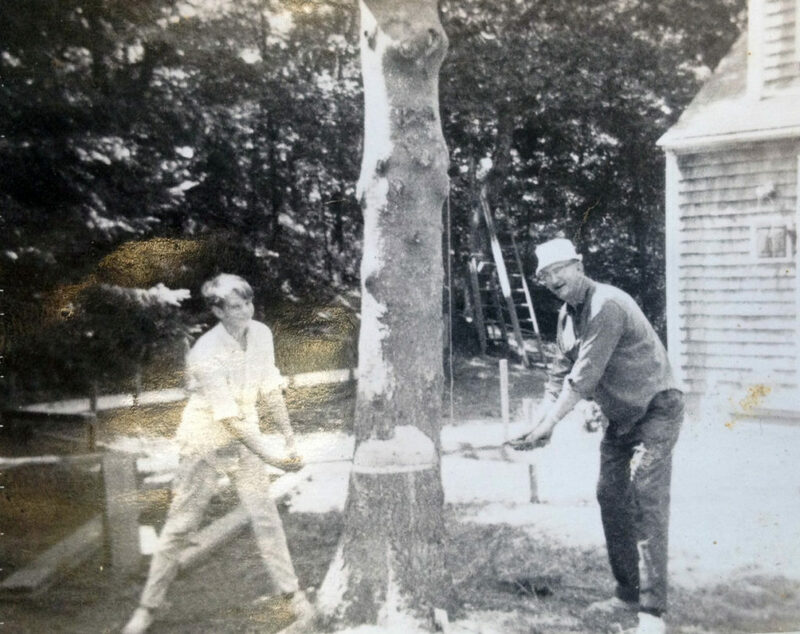 As the Hamilton children became involved with the business, it was evident that the residential location of Woods Hole Road was not going to be sufficient to allow for growth for the family business, so they began looking for areas in which to expand. The company was unsuccessful in finding a suitable and affordable commercial location in Falmouth, so they opted for a piece of property on MacArthur Boulevard in the neighboring town of Bourne to move the tree side of the company to, so that both the landscape and tree division had more room to prosper. The company never anticipated that the tree division would experience such quick growth, but in 8 short years, the tree division is already expanding beyond its current walls. Our main office and tree division are are now located on Rt. 151 in East Falmouth in the former Nickelodeon Movie Theater. This building once served as a fun place for Falmouth families to enjoy and it was important to us to not let such a great building go to waste. We hope our new location will help us to better serve the community. Stop by “The Nick” when you’re in the neighborhood!